A new Daft.ie report shows they've gone up by 9.8% across the country in the year to December 2018, to an average of €1,347. There's been an 8.8% increase in Dublin to just under €1,982. However, rents are up 16% in Limerick city and 16.7% Waterford city compared to the previous year. 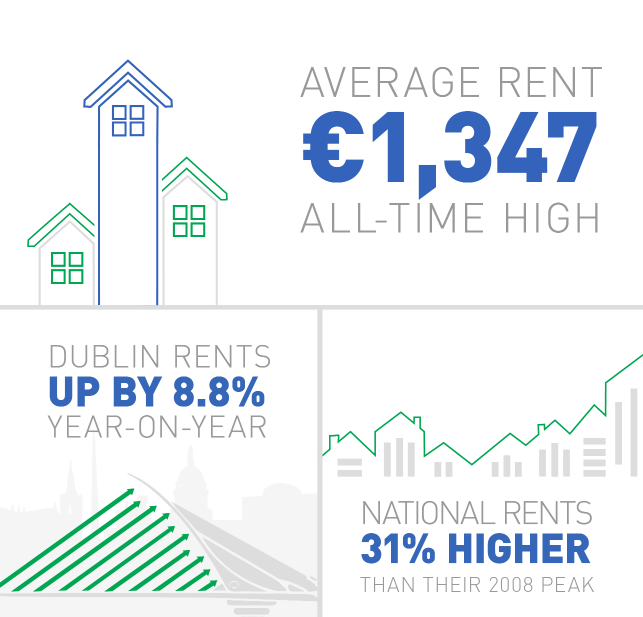 Galway's seen rent rises of 13.1%, and in Cork city they were up 11.4%. The report's author Ronan Lyons says it's still most expensive to rent in the capital - but rents are rising more slowly than elsewhere. He observed: "There's a very big gap between Dublin and the rest of the country in terms of the level of rent. "Now, in the last three to six months, the rate of inflation in Dublin has eased off a little bit - and is below what you'd see in other parts of the country." He said there was a 'rare improvement' in availability of rental accommodation at the end of 2018. However, he stressed there's a continued need for more homes - and therefore it "remains to be seen" whether the improvements continue. The Simon Communities group, meanwhile, insists stronger tenant protections are needed as many people are continuing to be priced out of the rental market. Responding to the Daft.ie figures, spokesperson Paul Sheehan argued: "Enhancing security of tenure has to be an urgent priority so that people already housed can keep a roof over their heads and have greater certainty in their daily lives. "People trapped in emergency accommodation need secure and affordable homes, with support where needed."